The 2014 event breaks with past tradition and move the entire event for a “Great Northern” edition, starting out from the Forest of Arden, very close to and with easy access to Birmingham airport. This will see Day One drive north and west to an overnight hotel near Blackburn – so crews can enjoy driving the remote roads of Lancashire and Yorkshire from the start. This gets the event into the Scottish Borders on Day Two… we then drive much more of Scotland than has previously been possible, in a giant loop that sees us finish up again at one of Scotland’s finest hotels at Gleneagles, north of Edinburgh. Anything pre-war, with a pre-war chassis, and a pre-war engine design. Exceptions? We are open to persuasion that an HRG is essentially a pre-war car, and so too is an MG T-Type. If it’s got two leaf springs at the front, then you certainly stand a chance. We want the right pedigree of cars, and more importantly, we want crews with the right attitude – one of the remarkable things about this event is that you are not surrounded by loads of whingers and moaners. And they come from all over the world to join in. Newcomers should read Robert Coucher’s 5-page report published in the July 2013 edition of Octane magazine – it’s on the newstands now. The most essential item of equipment is a sense of humour. This is a Regularity Road Rally with off-the-public-road Time Trials, and each day runs to a time-schedule. Very few reach the bar at the end of the day without having lost time somewhere… and those that do line up the refreshment for the rest of us. Crews should note that this is a “press-on-regardless” style of motoring made up of three long days of essentially daylight driving, down remote country roads, with frequent timed sections, tests on private land and checkpoints, all manned by experienced local motor-club marshals. The Flying Scotsman is the only long distance rally purely for Vintageants and is aimed primarily at those with some experience who enjoy an element of competition. Understanding the pressures of driving the very early models a different route with more relaxed timing is being dialled in for those in the Veteran class. 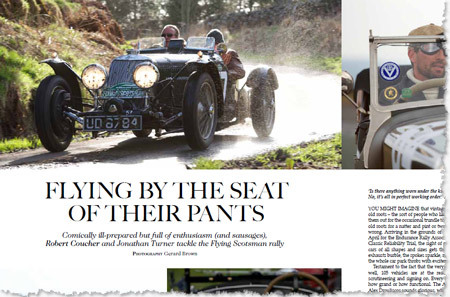 It is important to contribute to the unique atmosphere of the longest timed rally for pre-war cars by being correctly dressed – a dress sense that matches the era of the car entered is therefore going to win bonus points for one of the special trophies presented at the gala dinner at Gleneagles. The Organisation runs a luggage-bus for those who are bringing a car with only room for a pencil-case. The Endurance Rally Association has some of the most well practiced rally mechanics in the old-car world, we have seen pistons sticking out the side of engine-blocks and still they get the car to drive under its own power to the finish line. Our crews work all night and drive all day and like nothing more than a challenge. It helps if you bring a tow-rope. There will be briefing for competitors on the evening before the start to explain the format of the event together with tips on how best to tackle the different types of navigation and timing systems. However, if you want to brush on your navigating and co-driving skills with a spot of one to one personal tuition in advance, contact Alan Smith via the Rally Office. If this type of rally is new to you it could well make an enormous difference to your overall enjoyment of the whole event. 1 - Day One - Leaders swop seconds with cheering crowd…. A hectic day in the wooded surrounds of our Forest of Arden hotel saw 100 pre-war Vintageants line up for pre-rally safety checks with crews meeting up for the first time – they have come from far and wide. Several have shipped cars from America, and there is Canada and Australia on the entry-list among the 15 nationalities who will be taking the Starter’s flag at 8.0am tomorrow. Cars range from the tiny two-seater 750cc Austin 7 Ulster to the seven-litre 1912 Veteran Chalmers, one of several monsters with no front brakes. And in between no less than 25 Bentleys of various shapes and sizes, challenged by eight Lagondas, five sporting Vauxhalls, five Aston Martins, four Alvis, three Jaguar SS100s, three agile BMW 328s, and three MG’s including a rare K3 racer. With rarities such as The Riley Bigley Special in the hands of Americans Brad Mottier and William Hoff, and a delightful Triumph Gloria Southern Cross from Spain to be driven by Rafael Pueche, those now coming under Starter’s Orders represents probably the best entry yet in the six years of the Flying Scotsman. Ahead is a tough and challenging route, spiced with a mixture of competition along the way as crews battle against the clock driving a string of remote roads up the backbone of England to the Scottish Borders. There are 12 Time Trial Regularity tests – where average speed matters and seconds count – and eight off-road Special Test sections. Over 60 silver trophies are waiting and so is the champagne from event sponsor’s Bonhams. The Endurance Rally Association’s organisation team headed by Kim Bannister have put nine months of hard graft into the route logistics, backed by almost 500 marshals organised by Chief Marshal Bob Hargreaves from Britain’s local motor-clubs, who have worked together for the past five years making Britain’s longest timed event for pre-war Vintageants a success. The day has been hectic. Grey clouds came and went and the threat of rain held off, as cars went under the eye of a team of Scrutineers in their white Brooklands-style overalls before the crews signed on with the cheerful secretariat team from the Rally Office and received their time-cards and route instructions. There was then a briefing session for newcomers and a relaxed group meal together. Several cars experienced their first mechanical mishaps on the drive to the start hotel here just south of Birmingham near Arden. Matt Abrey had a wheel roll off his Ford Model A Special, luckily for him, the never say die Peking to Paris veteran, Bill Cleyndert, was nearby and was able to lend a helping hand so that both of the shiny bodied Fords managed to arrive at the start in time for scrutineering and signing on. A few crews experienced puzzling electrical mysteries, Fred Gallagher’s neat little Lancia Aprilia, fresh from an engine overhaul, had to find a electrician before setting out from Surrey for the drive north, and the Austin Seven of Peter Joseph lost its electrics and arrived being pushed up the hotel drive…. to be greeted by the E.R.A.’s team of sweep mechanics with their mobile-workshops parked nearby. The route ahead is three days through the Derbyshire Peak District, more rolling hills over the moorland of West Yorkshire, and on and over into Lancashire before pushing northwards on Saturday up remote rural roads to Peebles in the Scottish Borders – most of the crews will be staying at the Hydro Hotel, a regular haunt of the old RAC Rally, before a final day on Sunday finishing at Gleneagles hotel north of Edinburgh. At the end of the afternoon, 98 cars had assembled and were looking magnificent lined up together, and judging by the sounds they were making today they are eager to get going. After our evening meal together, the Dutch then all set off for a Night Section in the bar. Day One - Leaders swop seconds with cheering crowd…. With a long day ahead, the first car was flagged away at 8.0am – the big 7-litre 1912 Veteran Chalmers filling the court-yard of the hotel with a cloud of thick blue smoke. Competition in earnest began almost straight away, with the first of three off-road test-sections only a few miles from the hotel, and before that, to get everyone in the right mood, the first of the day’s four regularity sections was staged just minutes from being flagged away. Dirk and Nick Van Praag in the well turned out blue Delehaye 135M are delighted with their efforts, finishing in second overall, with penalties of 10 minutes and one second, with David Thomson navigated by Alan Smith in third seven seconds behind. Paul Carter and John Bayliss were equal fourth just four seconds adrift of the Talbot in their Bentley Derby Special, with Andrew Bailey and Philippa Spiller’s Bentley. Nick Jarvis and Ryan Pickering put up a determined effort in their Jaguar SS100, in equal-sixth spot, shared with the Lagonda LG45 of Rob Van der Leeuw. Fred Gallagher and Neil Oatley were 11th at lunchtime, and delighted, having just 38 bhp on tap to exploit in went on to keep up the the momentum in their Lancia Aprilia in the afternoon to end the day equal 9th with Matt Abrey’s polished bare-aluminium Ford Model A Special. With two visits to stately homes for special-tests between manicured lawns, and a blast around the Curborough sprint circuit, acceleration and braking were at a premium today. Those with grunt and good navigation shone when the sun didn’t, but agility and time-keeping certainly helped to provide two notable efforts from those with smaller engines. Two cars with just 1300cc finished the first day in the top 20…. as well as the little Lancia, a good effort was put up by the MG TC of Vincent and Victoria Fairclough, in 16th spot, ahead of the experienced Martin Hunt in his Bentley. Max Stephenson who has brought his 1925 Vauxhall all the way from Australia ended the day inside the top-20, with 19th spot, accompanied by Andrew Duerden, Jonathan Turner is 25th, and Sue Shoosmith and Trina Harley, having had a great morning and to be up with the leaders at lunch then fell down to 30th by dinner. Sue and Trina have it all to do now, having finished a remarkable second-overall last year. Today saw a glorious route driving northwards into the Derbyshire Dales and over the Pennines, with the weather remaining dry, to finish at Clayton le Moors. Along the way, knots of people filled bus-shelters and lay-bys to cheer on the cars – we must have been welcomed by well in excess of two thousand spectators, just about every village joined in with some setting up a street party on village pavements to provide drivers with literally road-side refreshments. The Lemon Drizzle cake in Midhope can be specially recommended… vintage cars being hauled round tight village corners were urged to pull up and take on a sausage roll, a slice of flan, or a chunk of the excellent Lemon Drizzle sponge. The camaraderie through the Dales, the Peak District and tiny villages of the Pennines made today a special experience for all 200 crew-members, as well as taking in some of Britain’s finest scenery. We drove into Scotland today, climbing up through the Durham Dales, into rolling Yorkshire moorland and on into Northumbria crossing Hadrian’s Wall, where the roads became wilder, and more empty, as the day wore on. Our day was laced with several timed Tests, a hillclimb and several regularity-sections which have given the leaderboard a shake-up. We have arrived into Peebles in the Scottish Borders, with William Medcalf and David Kirkham still leading the results table, but now with Paul Carter and John Bayliss, who have won the event twice before, mounting a serious charge – they have moved up to second, just over half a minute separates the two Bentleys. Nick Jarvis and Ryan Pickering have also moved up in their Jaguar SS100, now in third spot, just three seconds clear of the Talbot 105 Alpine of David Thomson and Alan Smith, with Fred Gallagher and Neil Oatley having another good day moving into fifth with the little Lancia Aprilia, ahead of Mat Abrey’s Model A Ford Special, and Jan Dingeman’s BMW 328. Andrew Bailey’s Bentley is eighth, and the Vauxhall from Australia in the hands of Max Stephenson has moved up to 13th position at the end of a long and demanding day. Follow the Results links, left, for the full leader board. Our run into Peebles was along an undulating switchback road through stunning open moorland, as the route carved its way across the Scottish borders – traffic-free open-road motoring very typical of the 1930s conditions still exists here. The day took in two coffee stops, the second in Newcastleton saw a large group of spectators throng around the cars. A river crossing proved a demanding test for some, the K3 MG Magnette with the air-inlet to the supercharged 1100cc engine set low down called for prudence of the extreme kind and a push through the water with the engine off, others were far more gung-ho throwing caution to the wind. There were two retirements today from back axle failure – the Bentley of Sue Shoosmith went out of the event having reached the Scottish border, and also the blue Delahaye of Dirk Van Praag, having been second overall yesterday. Among other dramas of the day, the red Jaguar SS100 of Shane Houlihan and Michael Jackson suffered a fuel leak. When an SU carburettor sprayed a hot exhaust with petrol – the engine caught fire, shooting flames through the louvres in the top of the bonnet, fortunately the crew were able to use their fire-extinguisher in time to prevent serious damage, and the car continues with blistered paintwork. Drivers pulled up at the end of a challenging three days onto the driveway of the Gleneagles hotel, with the champagne waiting on ice as they turned off their engines for the last time. The end of a momentous effort to reach the finish line is now being celebrated in fine style with a raucous party that promises to extend long into the night, despite the test of endurance and tenacity of competing against the clock for over 600 miles that makes this Britain’s 1,000-kilometre Trial. Victory is being celebrated by the Bentley Boys with the outright win of William Medcalf and newcomer to vintage rallying, David Kirkham, in their Bentley Super Sports, with Paul Carter, the leader of Kent County Council, and John Bayliss, less than a minute behind in second place. Paul and John having won the event twice in the past know what the victors’ champagne tastes like. Third place after a determined final day’s effort saw David Thomson and Alan Smith regain third place, just 26 seconds clear of the Jaguar SS100 of Nick Jarvis and Ryan Pickering, with the Ford Model A of Matthew Abrey in fifth spot. Andrew Bailey’s Bentley finished sixth, with Fred Gallagher and Neil Oatley slipping from fifth to seventh for a fine top-ten finish, admitting that a mistake on a regularity cost them dearly. Vincent Fairclough had an excellent day to shoot from 16th to eighth in his little MG TC – with Geert van de Veld behind in ninth, and Jan Dingemans completing the top ten in his BMW 328. Over 200 sat down to a glittering gala prizegiving, illustrated with 150 of Gerard Brown’s photographs shown on a giant screen during the dinner, and ending with a 25 minute film showing highlights of the three days. Over 70 trophies were presented to class winners, team award winners, and winners of both the veteran Pioneer Category and the Vintageant Category, and The Spirit of the Rally Award went to the Austin Seven Ulster crew of Peter and Richard Joseph, who on their first event managed to get the smallest car with just 750cc to the finish ….they ended the final day far from last in 59th spot. The Concours d’Elegance trophy went to Jan Dingemans with his BMW, and the Best Dressed Crew Award went to Matthew Abrey and Jasper Hulscher. Kim Bannister’s route book and organisation and the back-up of the finest team of sweep-mechanics in historic motorsport were thanked with loud cheers. And so ended the 6th Flying Scotsman. Rally Director Philip Young announced that entries for next year’s event will open in June – with the event starting in Harrogate in order to extend further our explorations of some of the finest open-road motoring in Britain. Visit the Flying Scotsman Photo Gallery to find many more of Gerard Brown’s pictures taken during the event. Click the Flying Scotsman Results Book to download a comprehensive results book. Click the Flying Scotsman Results Book to download the complete results book.